I spent four hours with a longboard yesterday, sanding the gunnels and stern decks yet again. I’m almost happy with the finish now. Just one more session of coating and sanding – or at least I hope so. The longboard is a lot of work and makes you move in unusual ways. Four hours of it is about as much as I can do in a day. Here’s the first coat of epoxy after glassing but before sanding. It’s shiny but very wavy. I’ve finished filling and sanding the second coat now and hope to do the third and final one this weekend. Then I can install the gas tank and the locker covers port and starboard, and install the sole over the tank. Here are the stern decks. I really like the way the whole stern area is turning out. 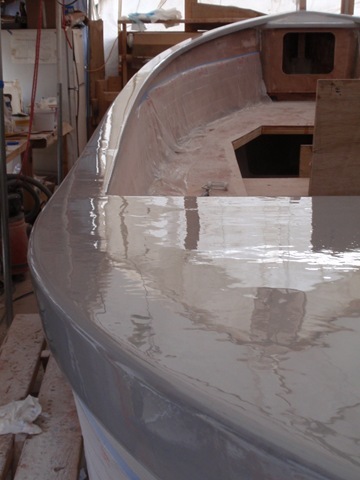 Being able to walk right to the stern and around the back of the motor will be a real joy. I can see spending time back here at anchor – barbecuing or just lounging on the decks. The round holes in the soles on either side of the motor well are for screw-out access plates to inspect the dead space below the decks. I don’t trust areas I can’t see, or areas filled with foam. Soggy foam creating rot in a hidden space sounds like a real nightmare. I have an interesting idea of filling the space with empty 1 quart water bottles. They’ll add a great deal of flotation if the area gets swamped, but can be removed easily and still allow some air movement in the space. I don’t remember if I invented this idea, or read it somewhere. 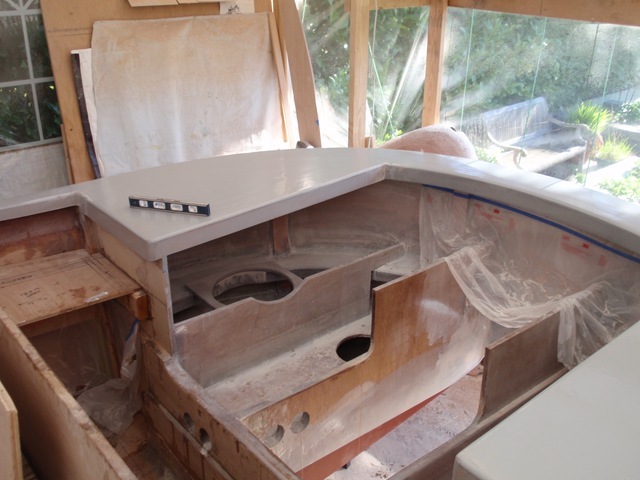 Propane tank locker, with the Starboard locker roughed in just forward of the stern deck. 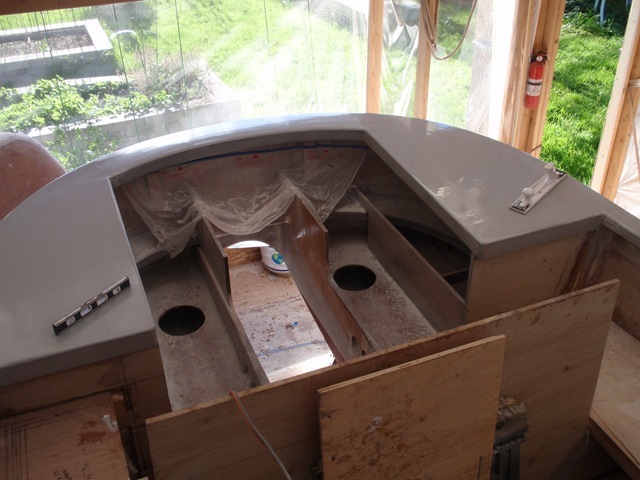 The locker will hold the fuel tank fill and all the hoses and wiring connecting the stern with the rest of the boat. It’s about 7 inches lower than the side deck so it’s an easy step down. Two more 7 inch risers take you down to the cockpit sole. This will make a nice seat back here also. There will be a vent under the side deck for locker ventilation. After work tonight I picked up some 2mm neoprene from Seattle Fabrics to add as padding under the gas tank. This was suggested by a thread on the WoodenBoat Forum, which I’ve become addicted to and find I must read daily now. Oh, Sam Devlin has just added a link to this blog to his newly-redone web site. I’m honored!